A lesser-known atrocity by Tipu Sultan is the destruction of Tonnur Lake apart from assaults on men, material and temples. Separated by time, we have lost the power to judge the damage done by Tipu to the people and the earth as well. 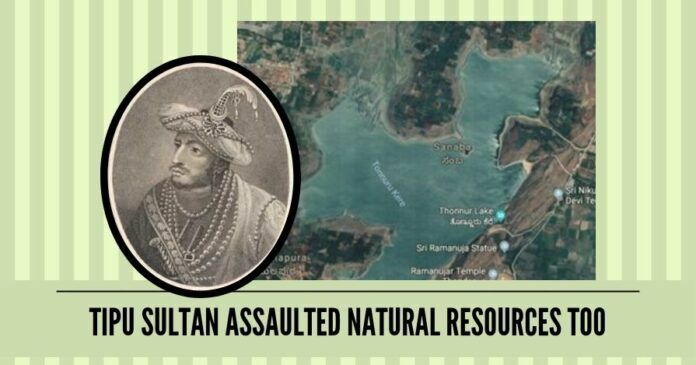 Tipu Sultan’s assault on men, material and temples is well known by now, but a lesser-known atrocity by him was the destruction he caused to Tonnur Lake, popularly known as Tonnur kere located in Mandya district. This lake was named as ‘Moti Talab’ by Nasir Jung, the Subedar of the Deccan in view of the crystal clear water ever present in this lake. The waters are so clear that one can see the pebbles at the bottom of the lake. It is really shocking that the 1000-year-old history of this lake along with its founder is completely unknown to many. But Tipu’s name continues to be associated with the lake. Popular notion today attributes the modern Moti Talab to Tipu Sultan! People also believe that he repaired the lake, but facts speak otherwise. A dig into the history of this lake shows that Tipu Sultan was the only person to have caused extensive damage to this lake which was subsequently repaired by the British. In a short period of 200 years after that, the atrocity was forgotten or twisted deliberately with the result the one who breached it was credited with having repaired it! And the motive for the breach was his hatred for Hindus, as expected. The “Souvenir of Mysore Album” from the collection of Lord Curzon says that “The tank was breached by Tipu Sultan in 1798 to prevent its being of use to the enemy, but was restored by the British and is maintained in good order”. 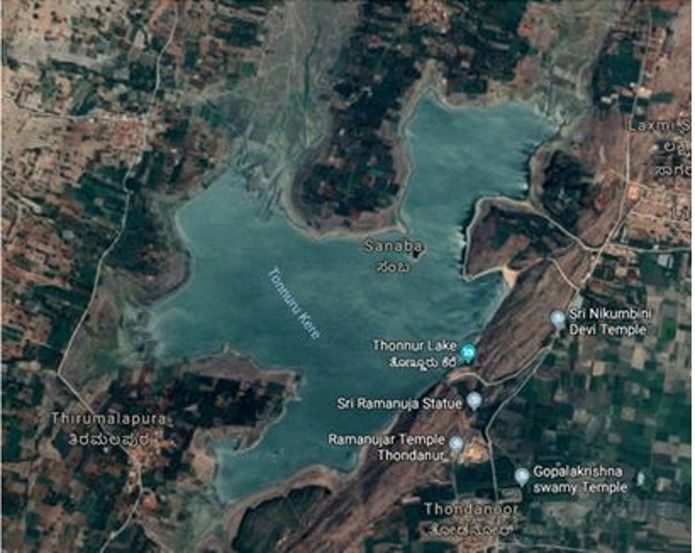 The same article also traces the origin of this lake to none other than the Hindu sage, Sri Ramanujacharya during his stay at Thondanur, now corrupted as Tonnur. The formation of this lake by Ramanujacharya is also well attested in Buchanan’s travelogue written soon after the fall of Tipu Sultan. In Buchanan’s times, the lake was known as ‘Yadavi Nuddi’. It was formed by two mountain currents that merged together and forced their way through a gap between two hills. He recounts that Ramanujacharya found a way to stop the water and closed the gap so that water could be stored in the form of a lake. The superfluous water was let off through channels cut through the hills. When the lake was full, it sustained agriculture for two years. Ramanuja’s involvement in the formation of the lake is also attested in the Sthala Purana of Shravanabelagola. It says that the Hoysala king Vishnuvardhana built the lake at the advice of Ramanuja. It also says that the lake was named as Tirumala Sagara, after the abode of Vishnu. This name is still in vogue today. The outflow channel of the lake is called as Ramanuja Gange, in memory of Ramanuja. It is really shocking that the 1000-year-old history of this lake along with its founder is completely unknown to many. But Tipu’s name continues to be associated with the lake re-christened as Moti Talab and as one who repaired the breach. Only a few years after Tipu caused the breach, Buchannan had visited Tonnur Lake. He was in Tonnur as part of an assignment to survey the region after the fall of Tipu. He had written that Tipu had made a narrow trench in the mound that closed the gap between the hills. Once the opening was made the enormous water stored in the tank gushed out with so much force that two-thirds of the mound was swept away. An opinion prevalent at that time was that Tipu wanted to destroy a monument built near the bund for a Hindu Doctor, venerated by Hindus and he achieved it by allowing the water to sweep it out. But Buchanan writes that “Although the demolition of this work by Tippoo was but a just retaliation for the enormities by which it had been erected, nothing could be more absurd or impolitic, both as giving offence to his subjects and as injuring the resources of the country”. Lieutenant Richard Bayly, one of the British officers writes that he preferred to face a hundred battles than the horrific storm that he witnessed at the time of Tipu’s burial. It was on this trip to Tonnur Lake that Tipu came to know about the presence of a monument near the lake for a fanatic follower of Ghazni who suffered martyrdom. Buchanan states that “his zeal against the infidels had been inflamed into a rage by the recollection of the martyrdom” and made him enlarge the mausoleum. How he enlarged the mausoleum can be understood from the Annual Report of the Mysore Archaeological Department for the year 1939. It says that the mausoleum now stands on the ruins of a Hindu temple. “Several pillars are Hindu. Some of these in the Mantapa bear figures of Hanuman etc.” So a Vishnu temple had been destroyed to build the mausoleum of the ‘fanatic follower’ of Mahmud Ghazi who was likely to be the one who ransacked the temples of Thondanur and Melkote. His accomplice had escaped with the loot that included the processional deity of Melkote, Ramapriyan. It was only after the survey by Buchanan, the breach had been repaired by the British. As if to pay back for the massive gush of waters caused by Tipu, the sky opened up suddenly at the time of burial of Tipu at the Gumbaz at Srirangapatna. “The funeral party escorting Tippoo’s body to the mausoleum of his ancestors situated in the Lal Bagh Garden, where the remains of his warlike father, Hyder Ali, had been deposited, were overtaken at the commencement of this furious whirlwind, and the soldiers ever after were impressed with a firm persuasion that his Satanic majesty attended in person at the funeral procession…. A fearful description of the Day of Judgement might have been depicted from the appalling storm of this awful night,” writes Lieutenant Richard Bayly, one of the British officers who preferred to face a hundred battles than the horrific storm that he witnessed at the time of Tipu’s burial. Such was the thinking of an army officer who had witnessed the atrocities committed by Tipu. Separated by time, we have lost the power to judge the damage done by Tipu to the people and the earth as well. Coming out fresh from celebrating Tipu Jayanti, a minister says that there should be “Dharma (righteousness) in politics but not politics in Dharma (religion)” By what Dharma can he and his ilk support Tipu for the enormous damage he caused to the natural resource of the earth? Is India a cursed or a blessed nation? Nice article. Makes his character even more exposed as well as the Congress’s. The Author deserves to be thanked for the exposition of Tippu. May I request her through this Blog to write in detail about Tippu and his atrocities in Mysore, Kerala and Tamilnadu? The picture of Tipu Sultan is wrong. Please search for actual picture of Tipu Sultan and use the correct picture of the tyrant. TIPU SULTAN, THE ANTI-BRITISH PATRIOT. A TRIBUTE BY SIR WALTER SCOTT. “Tipu Sultan realised that the British were a new kind of threat in India. He became the ruler of Mysore on Sunday, 22 December 1782, in a simple coronation ceremony. He then worked to check the advances of the British by making alliances with the Marathas and the Mughals. The Second Mysore War came to an end with the 1784 Treaty of Mangalore. It was the last occasion when an Indian king dictated terms to the British, and the treaty is a prestigious document in the history of India. According to a 13 February 1798 report by Talleyrand: “Having occupied and fortified Egypt, we shall send a force of 15,000 men from Suez to India, to join the forces of Tipu-Sahib and drive away the English.” Napoleon was unsuccessful in this strategy, losing the Siege of Acre in 1799, and at the Battle of Abukir in 1801. So despotic had been this wild beast !! And we have been stupid enough to celebrate him today ! !